BABY MINI SESSIONS START AT $300I offer all-inclusive packages for newborn, babies, maternity and families so that you have the digital images from your session to cherish forever. have held, the best by far is you. I just love photographing newborn babies. They are so precious and it’s such a momentous occasion in a family whether it’s the first baby or the fourth. Each baby has their own personality and special details and I try to capture that uniqueness in every session. Babies change so quickly. Within a few short weeks after birth your little one won’t be as tiny in your arms and their squishy newborn details will begin to change. My style is natural and artistic. I strive to create photographs that are unique, warm and classic. I like minimalism and simplicity so that your baby is the focus of the image. Welcoming a new baby is a significant time and I am honoured to capture this miraculous and special time for you. With each booking you will receive my prep guide that provides you info on what to wear and how to prepare for your session. Studio sessions have access to my neutral wardrobe for babies and mams including maternity items. A non-refundable deposit of $100 is due at booking and reserves the date of your session. I DO NOT hold session dates without a deposit. Two weeks after your session your photos will be viewable in an online gallery for about two weeks. Downloading of images and ordering prints (through my lab if you choose) can be done during this time. I offer all-inclusive portrait sessions so that you have the digital images from your session to cherish forever. Pricing is subject to change, but if they change I will honour prices at the time of your booking. If have any questions please contact me or check out my Q+A page which has more detailed information. Lifestyle and Studio sessions are available weekdays, during the day. Outdoor sessions will take place in the evening an hour before sunset between May and October. This varies depending on the time of year. I will let you know your start time when you inquire. I do offer Maternity sessions as well. Please inquire for more details! Studio sessions have the option of adding Parents and Siblings to the session. Expecting twins? I love photographing twins. Please email for more add-on details. 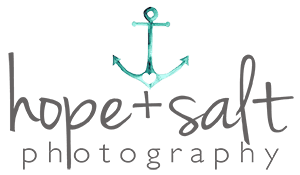 © 2019 Hope + Salt Photography | Burlington Oakville Newborn Baby Photographer|P7 Photo Blog|Design by Northfolk & Co.